If it were urgent, maybe we could be more forgiving. But the subject of that phone call one table away at Starbucks never seems to be vital. A bathroom renovation, maybe. Or a phrase-by-phrase recounting of a text message dialogue with an ex. If you suspect overheard phone conversations are inherently more awful than people talking face to face, you're right: research shows that these conversations reach across our espresso cups, grab our attention, and don't let go. Psychologist Veronica Galván studied this problem recently at the University of San Diego. To bring the coffee shop into the lab, she started by lying to about 150 undergrads. The students believed themselves to be in an experiment about reading comprehension. When they sat down at a table to solve a worksheet full of anagrams, another student sat down next to them and launched into a seven-minute conversation. This person, of course, was a plant. The neighbor had a scripted conversation, either over the phone or with a second actor in the room. (The discussion covered three typically scintillating topics: "a birthday party for dad, shopping for furniture, and meeting a date at the shopping mall.") Meanwhile, subjects tried to ignore the noise and dutifully completed their worksheets. When subjects filled out questionnaires afterward about how distracting they'd found the conversation in the room, their answers depended on what they'd heard. People who heard the one-sided conversation (a person on a cell phone) found it significantly more noticeable, more distracting, and more annoying than those who heard two people talking. Even so, all the subjects performed about the same on their anagram-solving test. Galván had expected to see a difference between people who heard a phone conversation and people who didn't, but she says the anagrams may have been too easy to show an effect. Conversely, they may have been too difficult to allow people's attention to wander. Galván hopes her future experiments will reveal what kinds of tasks are most vulnerable to distracting phone conversations. After their anagram test, subjects took a pop quiz about the conversation they'd just overheard. They saw a series of words and had to decide whether each one had been spoken in the conversation. In this case, the test results were clear. People who'd heard a one-sided conversation remembered it better than people who'd heard a two-sided conversation, Galván reports in PLOS ONE. Additionally, they rated their confidence in their responses higher than people who heard the two-sided conversation. It's possible people remembered two-sided conversations less clearly because they heard more words overall. But the idea that a one-sided conversation seizes more of our attention agrees with previous research on the subject. Because we can follow along with a two-sided conversation, its content is more predictable and therefore (the theory goes) easier to ignore. One person yakking away into a phone, however, is unpredictable and confusing. We can't stop our minds from trying to puzzle it out. The subjects in Galván's study were all undergraduates. "College students are fairly accustomed to overhearing cell phone conversations," she says. "Yet even they reported more annoyance and had better memory for the one-sided conversation." She suspects older adults might find cell phone conversations even more annoying and distracting than college students do. Until science finds a way to make other people's phone calls less bothersome, you're doomed to catch every word of that half-a-business-meeting being conducted two chairs over. On the bright side, you may remember it well enough to blackmail the guy in the future. I'm wondering when college students will get wise to the "plants" that so often turn up in psychology studies. Did you know that while holding your cell phone against your head it causes the transmitter against the head to expose people to the strongest radiation. If less people stayed off their phone then maybe people would pay more attention to things. Show me the bodies. Show me the people with cancers of the head (skin around the ears, brain, other tissues). Show me the UV, X-rays, and Gamma-rays emitted by mass-produced cell phones. If cell phones are causing disease, where are the sick people? 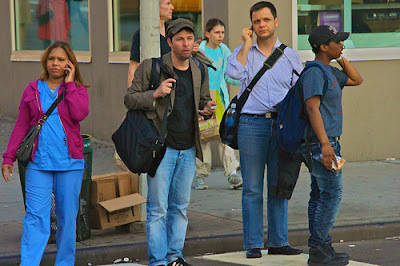 I've done a couple posts on the lack of evidence that cell phone radiation is dangerous. It's interesting to think of what would cause the brain to remember, subconsciously, a one-sided phone conversation over two people talking to each other. Perhaps between the Hippocampus and the Temporal Lobe processing this information is more personal when someone is seemingly talking to themselves. The fact remains that it's annoying, distracting and the person doing it is often rude as they're the person slow to respond to everything around them, (especially in cars- so dumb, so dangerous!) and blocking others from getting on with things, let alone disrupting your peace, on the train, in the cinema, in the bookstore, cafe, where-ever. If they were business calls I could almost forgive them, but nearly all of these conversations are pointless gossip. Get off the phone, life is passing you by. Try getting a life instead.